One of the most photographed streets in the city, the cobbled Elm Hill is packed with history, every building telling its own (sometimes spooky!) tale. Bookended at one end by the Church of St. Peter Hungate and the Church of St. Simon and St Jude at the other, there are wonky windows, thatched roofs and ancient architecture in abundance here. 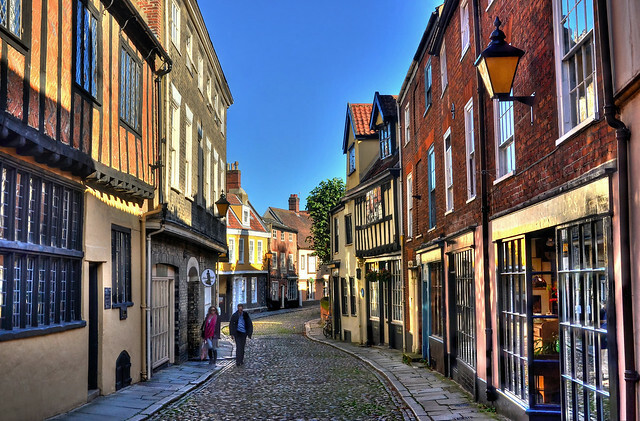 Although it was ravaged by a fire in 1507, Elm Hill is still one of the oldest streets in the city and is sometimes used as a filming location for Hollywood blockbusters. Eat and shop: pop into the Britons Arms for an afternoon tea, explore for potential treasures at Antiques & Interiors, or pick up something a second hand book at The Dormouse Bookshop. The Bear Shop, selling stuffed bears of all shapes and sizes, is definitely worth a peek too! The village of Walsingham has been welcoming pilgrims, particularly for Catholics, since Saxon times to its shrine to the Virgin Mary. The high street in Little Walsingham has red brick cottages, half timbered taverns and lots of historical nooks and crannies to see. Eat and shop: there are many religious book shops, second hand shops in aid of charities and tea rooms. At the top of the street is the Bull Inn, an attractive building that’s clad in ivy and serves real ale by the glass and comfort pub classics from the food menu. The green of The Buttlands in the pretty north Norfolk village of Wells-next-the-Sea is bordered with tall trees and enclosed by pretty old cottages and regency buildings. Eat and shop: the colourful Globe Inn serves seasonal food and sourced from north Norfolk producers. Enjoy the view of The Buttlands with a seat at the front of the pub. Traditional flint cottages, window boxes bursting with flowers and pretty gardens to ogle over; the High Street in Blakeney is a pleasant walk that leads down to the Quayside at the bottom. Eat and shop: Blakeney Delicatessen is a charming village shop with baskets of fruit and vegetables outside and plenty of pantry stockers, fine wines and local beers inside. Pop in to grab a sausage roll before exploring the rest of the village. The White Horse pub is located towards the Quayside end of the High Street, a short walk from the water. Order a plate piled with Norfolk mussels in a creamy shallot and parsley sauce or a hearty rump steak burger with Walsingham Cheddar, Ryburgh bacon and thrice cooked chips. 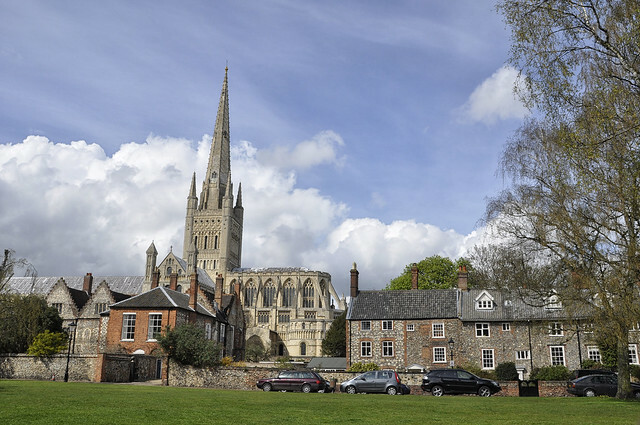 At one end of Ferry Lane is area around Norwich Cathedral known as The Close, a beautiful lawn surrounded by flint-clad houses and grand red brick mansions, and at the other end is Pull’s Ferry. Pull’s Ferry was built in the 15th century to allow building materials for the cathedral to be transported by boat. Eat and shop: the quiet area around the cathedral is free from shops and cafés but just outside the gated entrance is the bustling Tombland, home to lots of restaurants including Japanese sushi spot, Shiki. Although it’s very short, Hall Road, packed with charmingly wonky and mismatched cottages, all crawling with rose bushes and ivy, will make you want to move to this west Norfolk village immediately. Eat and shop: duck into the little second hand bookshop, Torc Books, to find your next read. Spend the afternoon on this small street with lunch at The Old Bank Bistro at the top. This family run, French-style restaurant has a small but tempting menu that is praised very highly by customers. Eat and shop: Cley Smokehouse serves fresh, smoked seafood sourced from the Norfolk coast. Dine at Cley Windmill with a three-course set menu for £32.50 per person that features lots of tempting Norfolk fare. Away from the main town, Upper Sheringham’s Church Lane is peppered with flint cottages running alongside the graveyard of The Parish Church of Upper Sheringham All Saints. Eat and shop: on the parallel road, Lodge Hill, is the Dales Country House and Upchers Restaurant which serves lunches, dinners and afternoon teas.